A ghost in the machine: do the Zuma Spy Tapes actually exist? If South African politics has an original sin (apart from, you know, Apartheid, four hundreds years of racial violence etc) it is probably the Arms Deal. Once that infected our politics, the contagion seemed to spread into everything. And if we have a secret political conspiracy that we absolutely know has happened, and has infected our body politic as a direct result of the Arms Deal, it is the decision by the National Prosecuting Authority in 2009 to withdraw corruption charges against now President Jacob Zuma. The justification for that decision was what's become known as the Zuma Spy Tape saga. Now one of the actors in this conspiratorial drama has suggested that actually, the tapes may not exist at all. This takes us quite literally, into Watergate territory. By STEPHEN GROOTES. In 2009, the then acting head of the National Prosecuting Authority, Advocate Mokotedi Mpshe announced what had already become public knowledge several weeks before: that the NPA was going to withdraw the charges against Zuma. This meant he would never be prosecuted for receiving the money that Schabir Shaik was in jail for giving him. Key to the announcement was the reason. What could it possibly be, that would stand up both politically, and legally? This was, quite literally, just before the 2009 elections, and Zuma was one of the most popular, and divisive, people in the country. So, when Mpshe said that it was on the basis of improper conversations between then Scorpions head, Advocate Leonard McCarthy, and former NPA head, Bulelani Ngcuka, proof was going to be needed. The proof was the “Zuma Spy Tapes”, recordings of the actual conversation between the two men discussing when would be the most politically damaging time to charge Zuma with corruption. That proof has never been publicly revealed. Instead, when the DA went to court to challenge the decision of the NPA to withdraw the charges, they had to go back to court to ask for the Record of the Decision, which in their view, and the view of literally every single lawyer I have ever spoken to except for Kemp J. Kemp and Michael Hulley, includes those tapes. After both the Supreme Court of Appeal, and then the North Gauteng High Court ruled that the tapes must be handed over, Zuma’s lawyers appealed again. The reason for this objection to the tapes being made public has never been given. Instead, time and time again, Zuma’s people will say only that this is part of a legal process and that he is exercising his rights. But there is no explanation as to why. So there has already been some suspicion about these tapes. What are they? Who recorded them? And crucially, how on earth did Zuma’s lawyers come to find out about these recordings in the first place. When Advocate Vusi Pikoli, the head of the NPA who was on suspension at the time all this happened suggests, quite seriously, that he’s not convinced the tapes actually exist, we have to ponder whether he is right. He made the comments on the Midday Report on Monday, during an interview following up comments made in his new book, My Second Initiation (co-written by EWN’s Mandy Wiener (Ed’s note: Grootes and Wiener work together at EWN, and were sitting next to each other in front of Mpshe, as he made the announcement). If Pikoli is onto something, and the tapes don’t exist, then we are looking at a conspiracy against the state on a monumental level. It would mean that Zuma, the NPA and the National Intelligence Agency have laid layer upon layer of lie in front of the nation. At first the NPA said it did not have the tapes and that two of its senior officials had gone to the NIA offices to listen to them. Those officials heard the tapes, made handwritten notes, and reported back that the conversations appeared genuine. But much later, in legal papers, the NPA appeared to admit that it does have the tapes, and that they are in custody. So this would mean that the NPA’s senior officials not only lied in 2009, they have lied in legal papers under oath to the country’s courts. It would mean also that the country’s spies are prepared to allow a lie to the nation to go un-challenged, and quite happy to play a very, very political role. It would be abuse of power of the Watergate magnitude. Pikoli, after his career in exile for the ANC, his history in battles with Apartheid spies, and his time at the Justice Department and the NPA, would have to know all this. Which means he might be flying a bit of a kite, simply adding to the pressure on Zuma to allow them to be released, so that everyone can hear them. And now we need to move to the tapes themselves. And look, when I say tapes, we’re really talking about computer recordings. Something with a wave image that your iPod would recognise. This means they are very easy to manipulate. There is plenty of Freeware available to download from the net that would be able to make any phone conversation sound like a highly cryptic political conspiracy (should you be in a position where this would be helpful, I would recommend Audacity. To completely make something up is not that hard to do. The reason that people don’t, is usually because the people you claim to have recordings of know that they didn’t say those things, and so then object, publicly. Since the existence of these tapes was first made public, there has been an almost complete and utter silence from both Ngcuka and McCarthy. And believe me, people have tried and failed to get them to speak on this. This would appear to strengthen the argument against Pikoli’s suggestion. Unless, there was some improper conversation between these two, and the conversation has then been manipulated in some way to make it sound much worse than it really was. But other questions arise that need to be answered. Zuma has made much of the fact that he was the victim of a political conspiracy. It would appear that these are the two people involved in that conspiracy. And while a conspiracy to make someone President is bad, so is a conspiracy to stop someone from becoming President. So then, why have they not been arrested? Why were they not charged? Why did they not get a chance to state their case in open court? We have to ask: did they do something wrong, and were forced to do a deal with the devil, that if they kept quiet, no one would act against them? The reason this just keeps coming back, despite Zuma’s best efforts, is that what happened in 2009 was wrong. There may well have been a conspiracy against Zuma before then. That was also wrong. But the fact Zuma cannot get away from is that it is he who is preventing us from listening to the evidence of that conspiracy. Grootes is the Senior Political Reporter for EWN, and the host of the Midday Report on Talk Radio 702 and 567 Cape Talk. 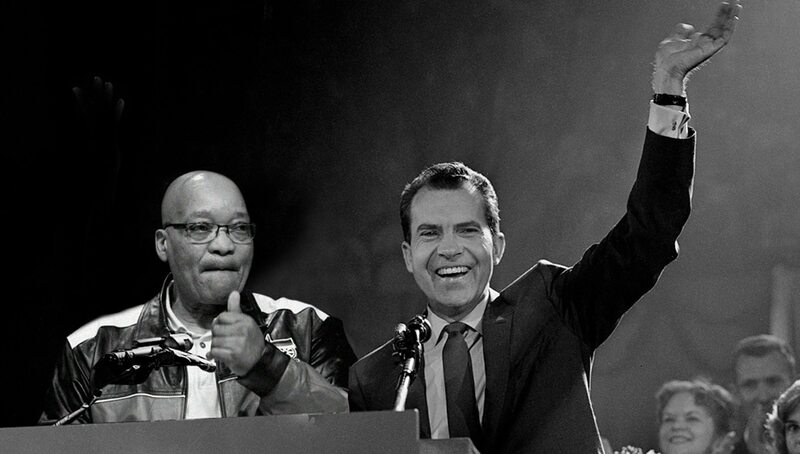 His new book, SA Politics Unspun is out now, and includes a section on the Zuma Spy Tapes.